*If you are installing onto a Wix website, click here for alternate instructions. The option to directly embed a campaign onto your website is one of our favorite and most-used integration options. It is ideal for adding an integrated call-to-action to your webpage, and is most commonly used on general donate pages, such as this one. To create a direct embed like this one, go to the Dashboard Main Menu > Operations > Integration Center and follow the steps within the Code Generator section. 1. Select if you'd like to embed a Campaign or Campaign Menu. 3. 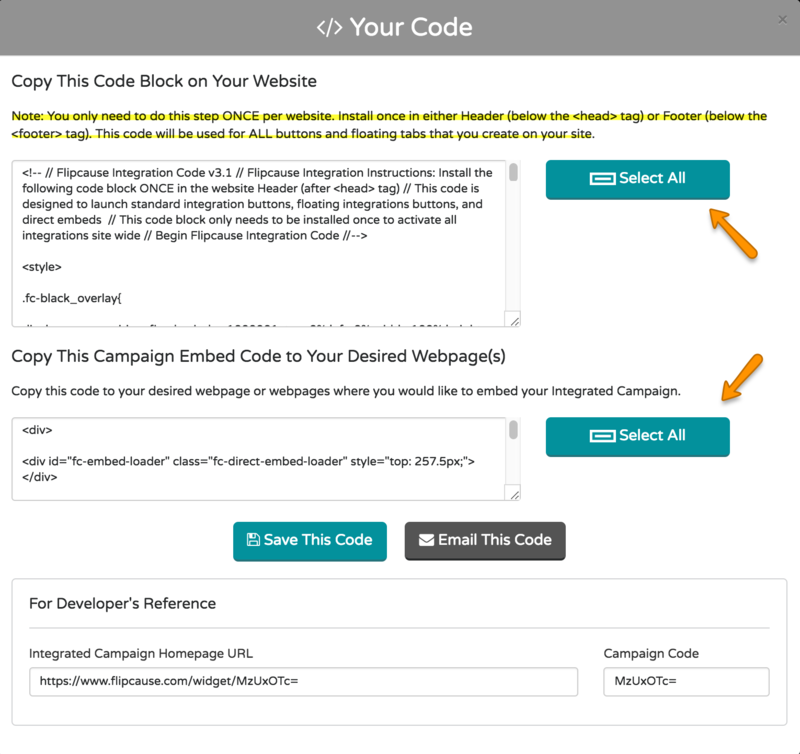 Once you pick a specific campaign (or menu) you will be shown a section to Select Integration Type. From here, choose the third option at the top row: Direct embed Integrated Campaign on a webpage. 4. Once selected, you'll see a live preview of the campaign you are embedding and a toolbar above that allows you to customize a few things. Most commonly, you'll want to take a look at and adjust the height to remove any unnecessary scrollbars from within the campaign preview. Most campaigns need to be 700 pixels tall or more. Any customization options you choose here will be automatically reflected in your live preview. 6. Once you're happy with what you see in the live preview and have selected your Website Type, click Generate Code. Then, depending on which Website Type you selected, follow the corresponding steps below. 7. Make sure you've installed the Main Flipcause Code on your website. You only need to do this once! 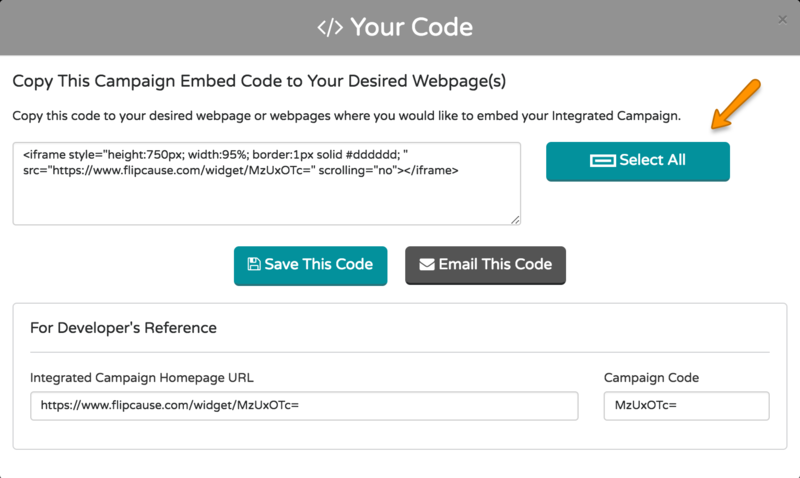 This code allows embedded campaigns and campaign menus to load on your website. Note: If you installed the Main Flipcause Code on your website before May 18, 2018, you'll need to update this code in the header or footer of your site. This new code improves the loading speed of embedded Flipcause campaigns and elements on your website.